New buggy platform for carrying a second child. Adaptable to pushchairs were the chassis’ width is between 32.5 and 43 cm and its tube’s diameter is between 17 and 27 mm or for chassis where their legs are square/rectangle then it fits chassis’ of up to 40 x 20 mm thick (Be cool Slide / Quantum). Suitable for children from 12 months up to 20 kg. 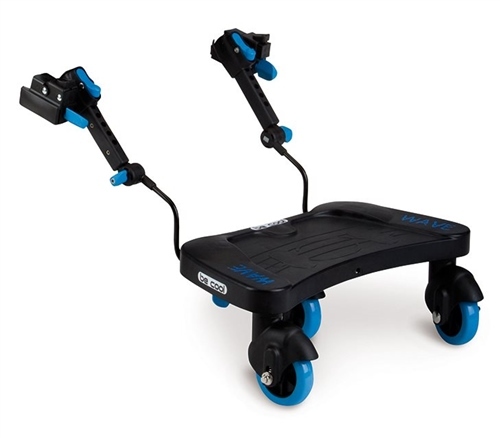 The platform has three wheels for greater resistance and stability. Supports that are easy to fit onto the chassis, and with which the pushchair can be folded. Quick and easy fastening of the platform to the supports. Materials: (body) polypropylene, (wheels) rubber, nylon, (connector parts) steel, nylon.